1) Hand out the list of Iffy and Witty Thoughts printout. 2) Playing only with Iffy Thought cards, separate the 13 Iffy cards along with their duplicates for a total of 26 Iffy cards. 4) Lay all the 26 cards face down on the table. 5) Taking turns, each player will turn a card face up and try to find a second card that matches it. 6) That player will read each card and it’s definition out loud. 7) If it’s a match, the player holds on to the pair. 8) If it’s not a match, the player turns both cards back to the face down position. 9) Players continue in this fashion until all the pairs are found. 10) The player with the most pairs wins. 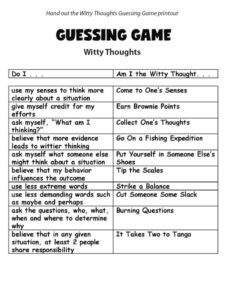 11) Repeat the above using the Witty Thought cards. 12) Play the matching game again. 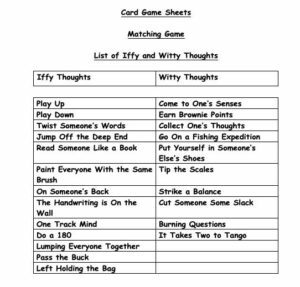 This time, use 7 pair of Iffy Thought cards and 7 pair of Witty Thought cards from the deck. 13) For the next round, add one additional pair to the deck of cards and place them on the table. 14) Continue this at the beginning of each round, until you have used all 46 cards from the deck. 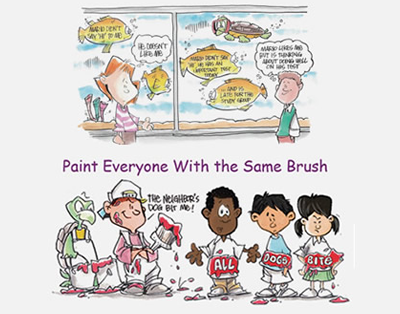 1) Hand out the Go Challenge printout. 2) Shuffle all of the cards and hand out 7 cards for 2 players and 5 cards for more than 2 players. 3) Place the deck of cards on the table and turn the top card face up. 4) All players look at the cards in their hands and at the printout. 5) Now, Players will decide if they have any challenging pairs in their hands. If so, they place these pairs aside. 7) If “the requestor” already has the challenging thought card in his/her hand, he/she has a “challenging” pair and places the two card to the side. 8) If “the requestor” doesn’t have the challenging thought card, he/she asks another player for that card. 9) If the other player has the card, he/she must hand it over to the requestor. 10) If the other player doesn’t have the card, “the requestor” has to pick a card from the deck. 11) If the card picked challenges the face up card then the requestor sets aside the “challenging” pair. If not, the requestor adds the card to his hand. 12) The turn moves to the next player. 13) Continue in this fashion until there are no more cards in the deck. 14) The person with the most “challenging” pairs wins. Be careful! Sometimes two Iffy Thoughts share one Witty Thought answer and other times, one Iffy Thought has more than one possible Witty Thought answer. 1) Hand out to all players, the Guessing Game print. 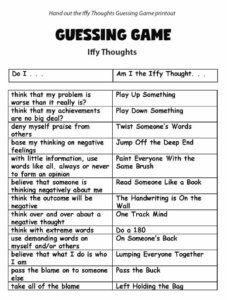 2) Start by separating the Iffy from the Witty Thought cards. 3) Shuffle the 26 Iffy Thought cards (including duplicates). 4) Place the deck on the table. 5) Each player will take a card and place it face down in front of him/her. 6) The first player, without looking at his/her card, holds up his/her card and shows it to the other players. 7) While holding up the card for other players to see, player 1 has a chance to ask up to 3 questions from the “Do I” column (on the printout) before taking a final guess from the “Am I” column (on the printout). 8) If the player guesses his/her card, he/she places the card to the side and picks a new card. 9) If the player doesn’t guess his/her card, he/she places the card in front of him (face down) and on his/her next turn he/she will ask 3 new questions and take a final guess. 10) The player with the most cards at the end of the game wins. 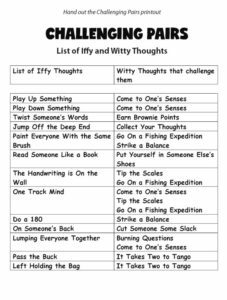 11) Repeat the above using the 20 Witty Thought cards. 12) Play the guessing game again. This time, shuffle both the Iffy and Witty Thought cards together. Then randomly deal out a total of 30 cards from the deck for a more challenging round. 13) Only for when you are using both the Iffy and Witty Thought cards together, you’re first question for a new card will be,“Am Iffy or Witty”? Consider that one question and proceed to ask 2 more questions from the “Do I” column and a final guess from the “Am I” column. You’re following questions/guess for that card will continue as previously described. 14) For each round add on 2 cards at a time until you use all 46 cards.